Naomi Armenta is committed to increasing accessible transportation options for people with disabilities and seniors. 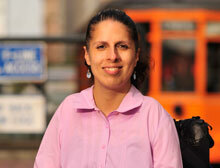 Naomi works at the intersection of accessible transportation with transit and pedestrian issues. Since 2006, she has served as the coordinator for the Alameda County Transportation Commission paratransit program. She oversees approximately $20 million in annual sales tax funding for transportation for seniors and people with disabilities, including policy and oversight for ADA paratransit as well as city and community programs. She excels at overseeing grant calls and all stages of public meetings. Previously, Naomi worked for over a decade in Human Resources for the Army and Air Force Exchange Service and City College of San Francisco. She is chair of the San Leandro Bicycle and Pedestrian Advisory Committee and serves on the Metropolitan Transportation Commission’s Equity and Access Committee. Naomi has twice been awarded for her advocacy and leadership on behalf of seniors and people with disabilities. Share the post "Naomi Armenta is committed to increasing accessible transportation options for people with disabilities and seniors."